Suunto Traverse Alpha continuously measures absolute air pressure using the built-in pressure sensor. Based on this measurement and reference values, it calculates altitude or sea level air pressure. Three profiles are available: Automatic, Altimeter and Barometer. For information on setting profiles, see Matching profile to activity. To view alti-baro information, press NEXT while in the time display or activate the alti-baro display from the display menu. You can change to different views by pressing VIEW. Sunrise and sunset time views are available when GPS has been activated. If GPS is not active, sunrise and sunset times are based on the last recorded GPS data. You can show/hide the alti-baro display under the start menu. While in the time display, press START. Scroll to End Alti-Baro and press NEXT. Repeat the procedure and select Alti-Baro to show the display again. If you are wearing your Suunto Traverse Alpha on your wrist, you will need to take it off in order to get an accurate temperature reading because your body temperature will affect the initial reading. If your outdoor activity requires accurate sea level air pressure or altitude, you need to calibrate your Suunto Traverse Alpha by entering either your current altitude or the current sea level air pressure. Absolute air pressure and known altitude reference = sea level air pressure. Absolute air pressure and known sea level air pressure = altitude. If FusedAlti is activated, the altitude reading is corrected automatically using FusedAlti together with altitude and sea level pressure calibration. For more information, see FusedAlti. Changes in local weather conditions affect altitude readings. If local weather changes often, it is advisable to reset the current altitude reference value frequently, preferably before starting your journey when the reference values are available. As long as the local weather stays stable, you do not need to set reference values. FusedAlti: GPS is switched on and the watch starts calculating altitude based on FusedAlti. Altitude: Set your altitude manually. Set the reference value using START and LIGHT. Accept the setting with NEXT. When not recording an activity, press START in the alti-baro display to get directly to the ALTI-BARO menu. You’re on the second day of your two-day hike. You realize that you forgot to switch from the barometer profile to the altimeter profile when you started in the morning.You know that the current altitude readings of your Suunto Traverse Alpha are wrong. So, you hike to the nearest location shown on your topographic map for which an altitude reference value is provided. 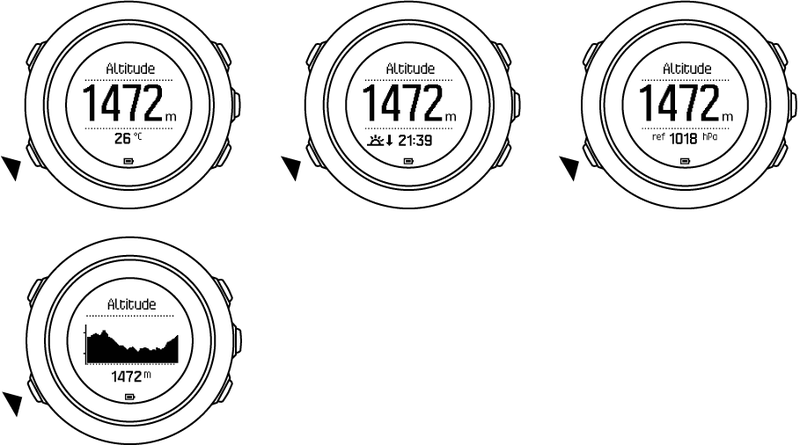 You correct your Suunto Traverse Alpha altitude reference value accordingly and switch to the altimeter profile. Your altitude readings are correct again. The altimeter profile should be selected when your outdoor activity involves changes in altitude (such as hiking in the mountains). The barometer profile should be selected when your outdoor activity does not involve changes in altitude (such as canoeing). To get correct readings, you need to match the profile to your activity. You can either let Suunto Traverse Alpha decide a suitable profile for the activity using the automatic profile, or choose a profile yourself. You can also define a specific profile for each of your sport modes under the sport mode advanced settings in Movescount. Scroll to Profile with START and enter with NEXT. Change the profile with START or LIGHT and confirm your selection with NEXT. If the altimeter profile is on for an extended period of time with the device in a fixed location while the local weather changes, the device will give incorrect altitude readings. If you use the altimeter profile and the weather changes frequently while you climb in altitude or go down in altitude, the device will give you incorrect readings. If you use the barometer profile for an extended period of time as you climb in altitude or go down in altitude, the device assumes that you are standing still and interprets your changes in altitude as changes in sea level air pressure. It will therefore give you incorrect sea level air pressure readings. 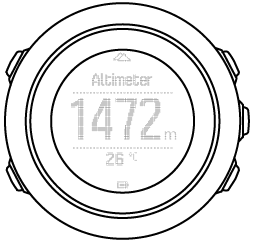 The altimeter profile calculates altitude based on reference values. The reference value can either be sea level air pressure or altitude. When the altimeter profile is activated, the altimeter icon is shown at the top of the alti-baro display. The barometer profile shows the current sea level air pressure. This is based on the reference values and the constantly measured absolute air pressure. When the barometer profile is activated, the barometer icon is shown on the display. The automatic profile switches between the altimeter and barometer profiles according to your movement. It is not possible to measure weather and altitude changes at the same time, as both cause a change in the surrounding air pressure. Suunto Traverse Alpha senses vertical movement and switches to measuring altitude, when needed. 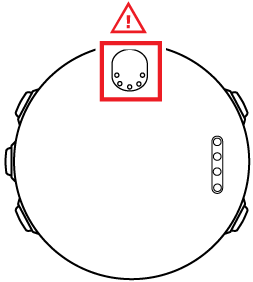 When altitude is shown, it is updated with a maximum delay of 10 seconds. If you are at a constant altitude (less than 5 meters of vertical movement within 12 minutes), Suunto Traverse Alpha interprets all pressure changes as weather changes. The measurement interval is 10 seconds. The altitude reading remains steady and if the weather changes, you will see changes in the sea level air pressure reading. If you are moving in altitude (more than 5 meters of vertical movement within 3 minutes), Suunto Traverse Alpha interprets all pressure changes as movements in altitude. Depending on which profile is active, you can access the altimeter or barometer in the alti-baro display with VIEW. When you are using the automatic profile, barometer or altimeter icons are not shown on the alto-baro display.